The cry of an unfamiliar bird awoke me. Looking out of the motor home I realized that we were not in Austria anymore. My son Stefan and I had flown half way across the world to the remote territory in the Northwest of Canada in the wilds of the Yukon. The view outside was stunning as we had parked at the edge of a seemingly endless frozen body of water called Lake Atlin with snowy mountains on the horizon as far as the eye could see. 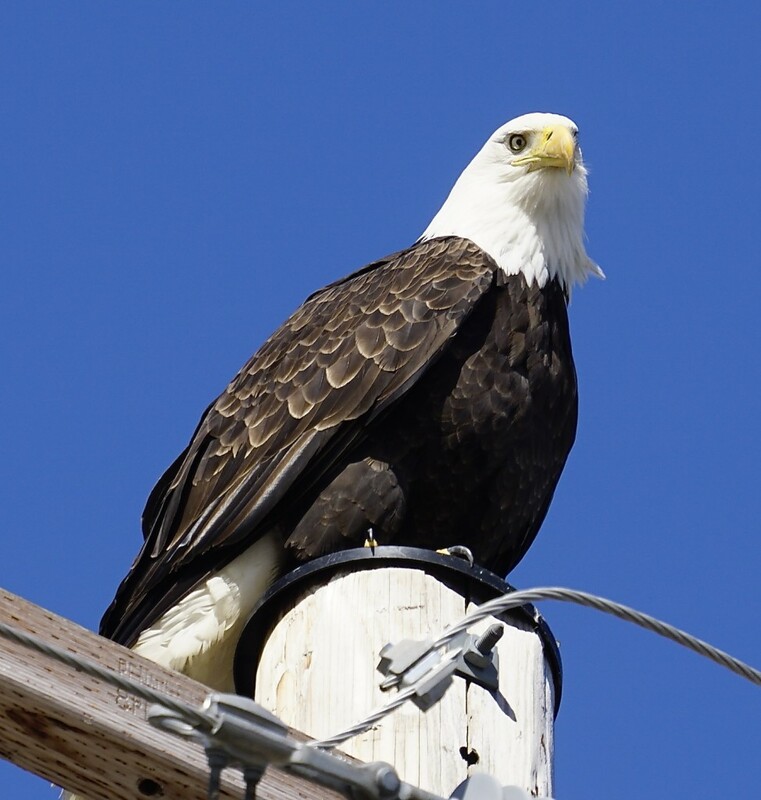 The bird turned out to be a large bald eagle with its recognizable dark brown body and a white head and it was majestic. We were lucky to catch some spectacular footage up close of this formidable bird of prey at the beginning of our third movie of our Canadian sojourn. My son Stefan and I had decided to take a special adventure trip together to celebrate my 60th and his 25th birthday organised by Furtenbach Adventures. Our original destination was heli-skiing in Japan but it was canceled unexpectledly and instead we chose the other side of the planet. The itinerary was a very different type of trip, rather than hotels we travelled in large motor homes with two people per vehicle with the advantage being that we had the option to go where the weather and the snow were most optimal. We flew into Whitehorse, the capital of the Yukon and began our journey there. Our small caravan consisted of three motor homes with five participants and our Austrian guide Harald. After our group stocked up with supplies we drove south on the scenic Alaskan Highway into British Columbia. We had changed from our original destination, the Haines Pass and were lucky that the weather was much better in Atlin, and that the local Atlin Heli Sports was able to accommodate us. After arriving Harry gave us a thorough avalanche preparation course including how to trigger the reusable airbags. The charismatic owner André Gutenberg and his lovely wife and daughters as well as his team took great care of us. The following day we cooked out and spent the night on the lakeshore. As my son was taking photos around 11:30 pm he noticed a green sliver on the displayed picture on the camera. We hadn’t detected it with our eyes yet but it was the beginning of the Aurora Borealis and we watched the sky turn into a green spectacle for 20 minutes. It was quite a sight to see. We awoke with anticipation to our first day of helicopter skiing and all kinds of activity at the “ranch.” André informed us that he had obtained the rights to a mountain area that had not been skied for many years and that he was going to check it out with some other guides. We were to follow behind. Of course we were really excited about that, especially that he would consider our skiing skills good enough to follow his team. Our group consisted of three others from Germany including Jo from Swabia, and Tobi and Michael from Bavaria. They were all great guys and we became good friends. The mountains were a good distance away and our guides flew with the helicopter while we were transported to the mountains with an old de Havilland Beaver. The sturdy plane was 62 years old but flew like a youngster, piloted by the always happy Chris. 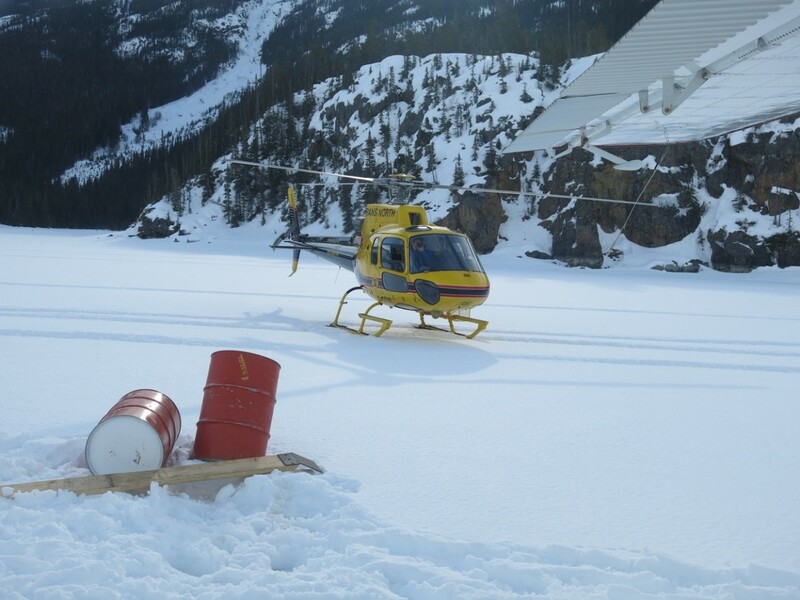 Our trusty transport landed on the lake near two big oil barrels that contained gasoline for the helicopter. A few minutes later the heli arrived and took us to our first landing site near the top of a mountain. We had received strict loading entry and exit procedures that required us to huddle with one knee near the aircraft on the ground so to avoid any possible contact with the overhead blade. First the skis and airbags were loaded into a side metal box of the heli followed by our group with four in the back, the lightest in the middle, and the guide on the left side. Due to Stefan being so light were we able to fit 7 people into this helicopter. The entire landing process took less than a minute before the pilot lifted off again. Unfortunately for us on the first day the weather and visibility was not all that great. The remote location was incredible but the snow conditions were challenging, nevertheless we were elated. Our group followed the tracks of the guide group, sometimes veering off a bit to get fresh powder. Whenever we got to the bottom of a run the heli was there in no time, and we flew off to begin anew. The weather improved as we also descended further into the valley and below the tree line. Meal time proved challenging as well. Lunch was served next to the heli at the bottom of the run but getting there we had to master the increasingly difficult terrain ending in complete slush. I had borrowed a pair of skis and they were not as wide as what the others had and I definitely paid the price for it that day. After a wonderful lunch of hearty soup and sandwiches we had a few more higher runs then headed on home. We were surprised by a wonderful steak dinner that Mira, André’s wife, cooked for us. The next morning the process was repeated but his time Stefan flew with the guides. This day I borrowed some really fat Kästle skis that were perfect for the terrain and was then able to thoroughly enjoy the entire day. We flew to two distinctly different areas and had a blast with the snow quality improving due to the lower temperatures. On the third day in Atlin we went snowmobiling with our guide who lead us to the Hinterland and prepared a wonderful barbecue with delicious Moose burgers. The only casualty that day was Stefan’s drone which he had the bad luck of flying it into a tree as he was filming. Fortunately two sets of rotors fixed the little critter that provided us with so much amazing footage. 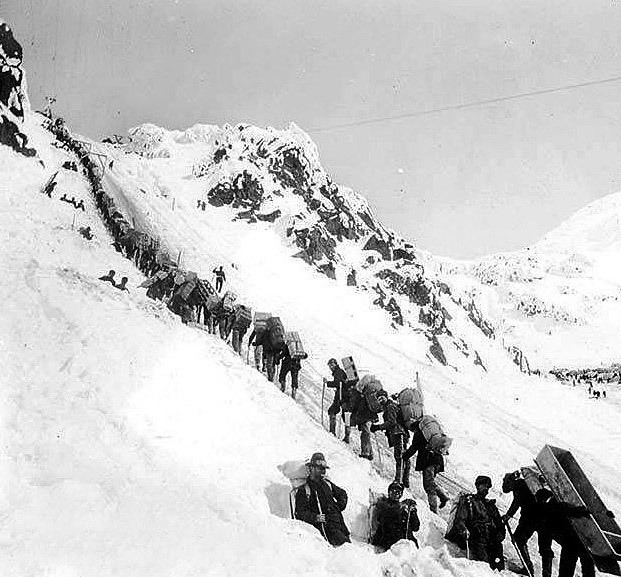 The following day it was time to say good bye and head back north, then southwest to Carcross – originally called Caribou Crossing – from there over the White and Chilkoot Pass across the Canada – US border to Skagway. Our route was an amazingly beautiful drive that followed the famed Klondike Trail that so many hopeful prospectors traveled in the last years of the 19th century to pan for gold. The town of Skagway still pays tribute to that time and in the summer visitors can take the Yukon Route Railway up to the White Pass. We made camp at a quiet park near the Skagway town hall and had a nice dinner in town with lots of locally brewed beer. The following day we took a one hour ferry boat to Haines across the sound. It was a beautiful sunny day and we saw the destination of our next ski adventure beckoning us from the distance. In Haines we checked in with SEABA, our next heli company that had a sprawling lodge on a hill overlooking the ocean that was not far from downtown. In the lodge we met a rowdy group of bartenders from Lake Tahoe, California who were spending ten days in Haines. Stefan immediately connected with these guys since he had grown up in Southern California. We had to wait two more days before the weather was acceptable for flying, so we explored the town and its surroundings and ventured out to the Chilkoot State Park. The next day we drove up the Haines Pass, where another heli outfit was located. This had orginally been the place where we had planned to ski first but decided against and it turned out to be a good choice we had made. A Red Bull film crew and a professional snowboarder had been holed up there for a week due to bad weather. Despite the weather we drove further on and took a 2 hour ski tour in heavy winds and fog, at least we got to use our muscles a bit. Friday came around and there was an excitement in the air at the lodge. The guides met at 7 am and the cook had prepared us a fantastic breakfast. We prepared and loaded up our skis, airbags into the shuttle vans and took off promptly at 8:30 to the close by airport. Each one of us was given a climbing harness and a radio, and we were weighed with and without all of our gear. We were assigned a cheerful guide named Austin and took off into the clear skies with breathtaking scenery below us. It was the most unbelievable day. 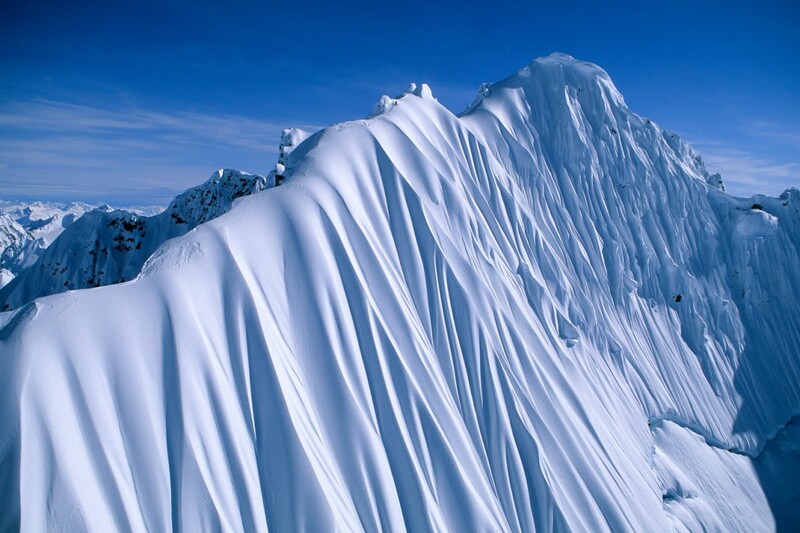 The mountains were much steeper than Atlin, in fact Haines is a place were many professional extreme skiers come to film incredible descents. Our fifth run was called the Pineapple Express and was named after a weather phenomenon. Just looking down the steep 50 degree descent sent shivers down my spine. Our guide took out his climbing rope and secured a second guide so he could test the stability of the snow. All checked out so the first group skied down one by one. Then it was our turn. Stefan dropped in and lay down fast powder lines. Two thirds down the slope there was a snow hill sticking out, which he attempted to use for a jump. Unfortunately it was an icy mound, he landed badly and ended up somersaulting several times without his bindings opening up. Both of his legs were severely shaken around in his boots, that gave him a contusion in both calves. He ended up doing one more run but then had to quit because of severe pain. Even though he was able to walk just fine when out of his ski boots unfortunately he could not ski again. We did 8 flights and runs that day and it was definitely the most epic ski day of my life. To top off the day despite Stefan’s injury we did enjoy a fine seafood feast of Alaskan king crab. Saturday brought some great weather to begin with but we had to stop after four runs because of clouds moving in. The following day Jo and Michael attempted to go out but ended up with only two runs and a lot of waiting at the airport. To our surprise the company then gave us a gift of another four runs the following morning. Our guide was on a snowboard and we finished skiing with some wonderful powder. Our last evening our group came together for our farewell barbeque on the beach and we made a strong fire and grilled some awesome ribeye steaks with baked potatoes professionally prepared courtesy of Harry. The setting sun bid farewell to this incredible scenery with its glaciers down to the ocean and steep mountains reaching to the skies. Our drive back into Canada via the Haines Pass to Haines Junction and then onto Whitehorse was uneventful and we returned our RVs. The next morning we left for Vancouver while the others headed back to Europe. We spent a nice evening in one of Canada’s finest cities and flew back home the following day. It was an adventure of a lifetime.